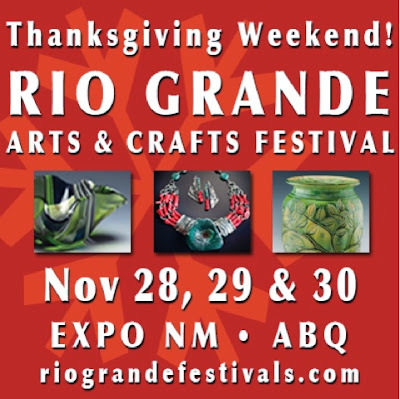 I am really excited and so looking forward to spending a second Thanksgiving in Albuquerque, New Mexico doing this fabulous art show. Last year my husband and I had a ball at the show and discovered so many wonderful things to see and do in Albuquerque. For most of my life, my family has traveled to nearby New Mexico. I grew up visiting Taos and Red River as a child. As a teenager I first set foot in Santa Fe where my dream of living and showing my art first began. We visit Northern New Mexico frequently and feel at home there. If it weren't for our family and grandchildren so close, a terrific old house and jobs we love....we would pack up and move there in a heartbeat. We live in a such a remote part of the world that it takes a long drive if we ever fly anywhere. The cheaper rates to fly out of Albuquerque drew our attention a couple of years ago and that was our first time to spend much time there. Also, after binge watching "Breaking Bad" we were intrigued about the place. Now we can't wait to get back. The show is awesome, the town is filled with wonderful restaurants, theater and shopping so we are both itching to go. If you are anywhere close, please come visit me. In fact, give me a holler and I'd be glad to get you discounted tickets to the show. See you there.